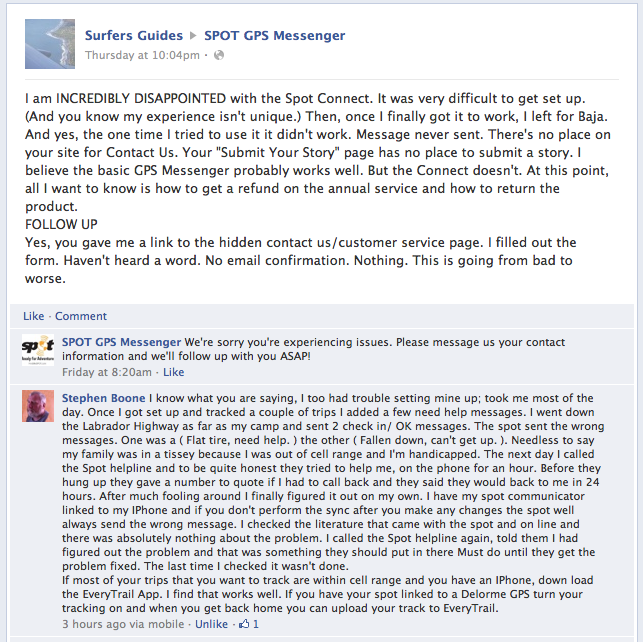 UPDATE – After a few conversations with Spot, they graciously decided to refund my service subscription fee. The Spot customer service people were very professional and helpful. They acknowledged there were software problems (app), and suggested I tried the latest version of the app. I declined, as I really don’t want to be testing this product. I want it to save my life. So all went well with Spot. That left me dealing with the hardware, which I had purchased at Best Buy. All I could get was store credit, which I suppose is better than nothing. So all is good. I may try the Spot Messenger. We’ll see. When a product is advertised as something that could save your life, it had better work. The Spot Connect doesn’t. I looked into Spot products on the advice of Surfline’s Sean Collins. 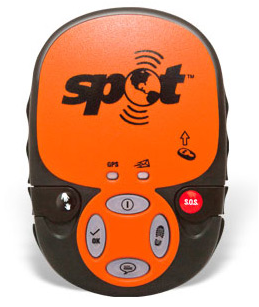 In his article on Baja surf travel, Sean recommended the Spot Satellite GPS Messenger as a “don’t leave home without it” product. If stranded out of cell phone range, this satellite communications product would send a message to loved ones and help at the push of a button. “I need this” was my reaction. The Spot Connect – Doesn’t work. I went to the Spot website and learned of another product, the Spot Connect, a device that Bluetooth-links to your smartphone enabling texts and basically more functionality than the Spot Messenger. With all the testimonials and stories on their website about the rescues due to the Spot products, coupled with Surfline’s recommendation, this seemed like a no-brainer. But I messed up. I should have researched more, in which case, I would have bought the basic product instead. The Connect doesn’t work. Whether it’s the app, the firmware, or whatever, it’s a waste of money that risks your safety. Stick with the basic product. More on this story here at The Surfer’s Guides blog. The best instructional video on how to get your motorcycle into a pickup truck without ruining the bike or yourself.